Roald Dahl’s timeless tale comes to life on the Kennedy Center stage. WASHINGTON — Seriously, what was Roald Dahl eating for breakfast? The guy was on fire when it came to writing wonderfully weird children’s classics. Now, that timeless tale hits the Kennedy Center with “Matilda the Musical.” Written by Dennis Kelly with music and lyrics by Tim Minchin, the show played in London’s West End in 2011, won five Tonys on Broadway in 2013, and now stops in D.C. as part of the U.S. national tour now through Jan. 10. “When we got the schedule for the tour, the first place I noticed was Washington D.C. and I thought, ‘Oh my gosh. I can’t wait to go there! I can’t wait to do the Kennedy Center! … We’re really pumped to bring this story and this show to the capital,” actor Quinn Mattfeld tells WTOP. First published in 1988 — and adapted into a 1996 film starring Mara Wilson, Danny DeVito and Rhea Perlman — the tale follows young Matilda, who grows up in Buckinghamshire under neglectful parents and strict schoolmasters, Miss Trunchbull and Mr. Wormwood. Taken under the wing of kind teacher Miss Honey, Matilda fights back with her brilliant mind and telekinesis pranks. “It’s a fantastic show about a little girl who’s very, very special. She has an incredible mind, the ability to do calculations in her head, and she reads Dostoevsky. … She’s a really special person in really bad circumstances, and when I say bad circumstances, I’m referring to myself,” Mattfeld jokes. Mattfeld plays Mr. Wormwood, a crazy hair-dyed role that won Gabriel Ebert a Tony on Broadway. The role is a “sleazy, stupid, English used car salesman / crook” and one of the show’s “great comic villains.” In Dahl’s work, the darkness and the comedy have always gone hand-in-hand, from the giant sharks chasing James on his giant peach, to the psychedelic boat trips of Willy Wonka. 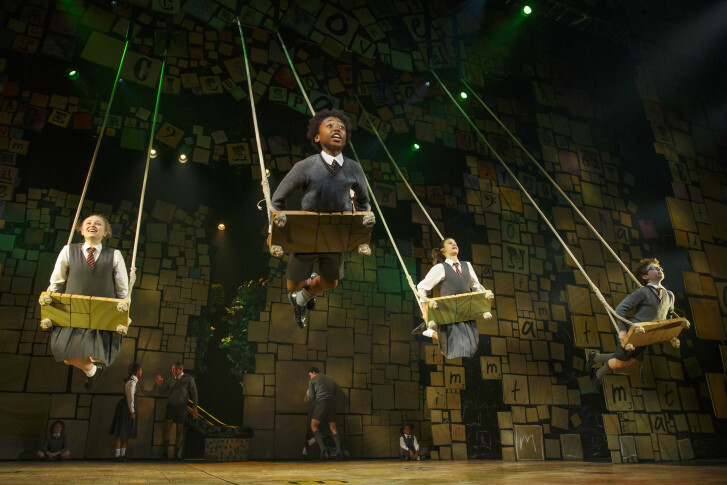 The job of “Matilda the Musical” is to bring those fantastical elements to life. These dazzling visual effects are matched by an array of Tony-nominated songs by Minchin. Other memorable numbers include Miss Trunchbull’s “The Smell of Rebellion,” Mrs. Wormwood’s “Loud” and Mr. Wormwood’s rockabilly salute to television “Telly.” Still, the most showstopping number is “Revolting Children,” performed by the children in the cast. “It’s the one that’s always stuck in my head when I’m trying to go to sleep,” Mattfeld jokes. Beyond all the sights and sounds, “Matilda” resonates most because of its universal themes. “The thing that I really love about the show is it’s exploring the idea that you are in charge of telling your own story, and if you don’t like the way it’s going, you get to change it. … Matilda is telling stories all the time and her parents make fun of her because all she cares about is books and stories and imagination. It’s kind of a love letter to storytelling. It’s operating on that level. The stories that you tell yourself and that you tell other people really do have an effect on your life,” Mattfeld says. This message is suitable for the entire family. This external struggle between kids and adults — and the internal struggle between the kid and adult in us all — keeps drawing us to the theater, with eternal lessons on the wonder of imagination.